← SEO: Help! I can’t find what I want on Google search. They paved paradise. And put up a parking lot. 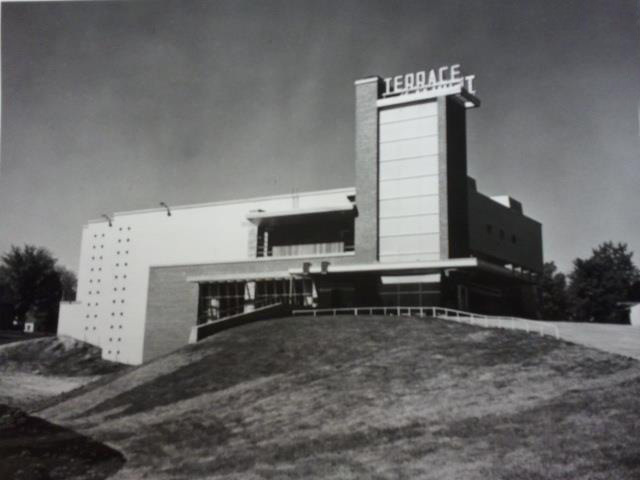 Photos of the Terrace Theater, circa 1960, from the Robbinsdale Historical Society. The Terrace Theater has stood idle, it’s windows and doors covered with plywood and interior gutted since it’s last movie showing in 1999. Now it’s under immediate threat of demolition, likely to be replaced by a homogenous, “Anytown, USA” strip mall/grocery store development. But in fact, this parcel of land is so big that a simple relocation of the planned grocery store could prevent demolition of the theater and provide an attractive, differentiating feature to a retail site that has struggled, even in the very recent past. Built by Lithuanian-born brothers, Bill and Sydney Volk just after WWII in 1951, in the modest, working class second tier suburb of Robbinsdale in Minneapolis, the Terrace Theater is of the rarest of rare — a soaring and inspired mid century movie palace, created by architects Jack Liebenberg and Seeman Kaplan with Space Age taste, design and quality inside and out. 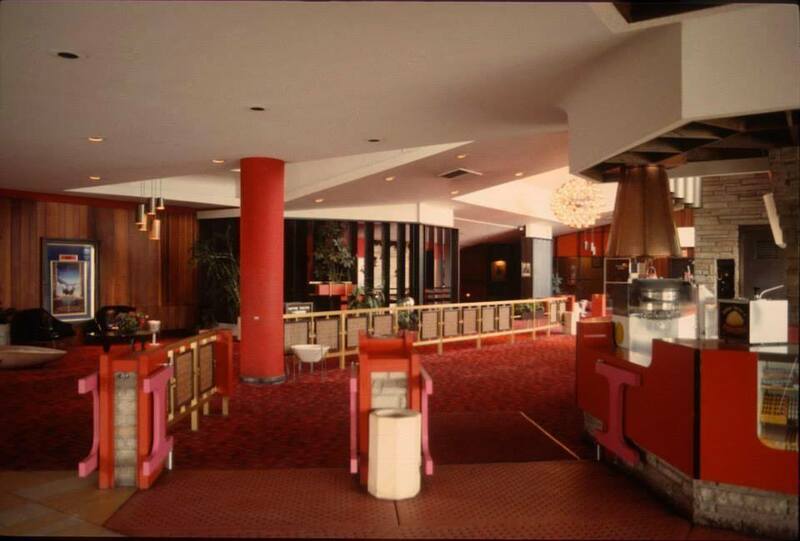 It’s been recognized nationally by architectural historians as “one of the first ultramodern theaters in America” and considered by historian Larry Millett to be the builder’s masterpiece. Last year over 1,700 people signed a petition to stay any demolition permits, with more than 190 people writing comments of support. The Terrace Theater gets an unusually beautiful siting atop a hill. Present details are sketchy. It’s been rumored the board of the non-profit, Save the Historic Terrace Theater, made an offer to purchase the theater recently. The offer was refused and the property kept in limbo by it’s current owner, Brixmor/BlackStone, a REIT that owns hundreds of such properties throughout the nation. One might suspect Brixmor of using the common developer’s tactic of forcing the theater’s demolition by intentional neglect. It’s been reported that $75,000 has already been spent by the city for asbestos abatement, with more funds available from the federal program if needed. The last figure quoted to make the theater habitable is a surprisingly low $500,000, though it could be expected to be many more times that. A “blight” study (blight is a loaded term, hijacked from agriculture by the often-criticized city redevelopment movement of the 1950s-1970s) is rumored to have been conducted by the city recently but that study has never been shared with the public. No one from the non-profit has been allowed inside the building to estimate costs. 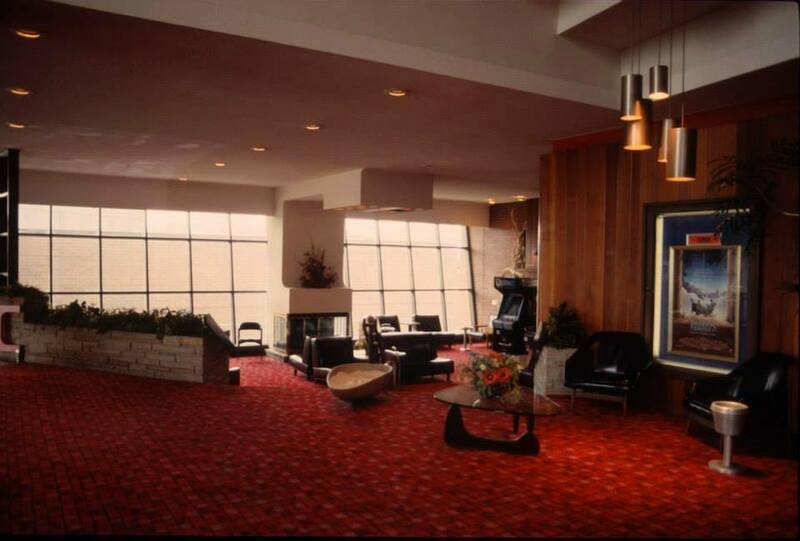 The Terrace Theater accords us with Space Age luxury, complete with two snack bars, a sunken lobby, party rooms and a TV room—after all, this is 1951, and television is still quite a draw. The soaring interior light-filled space of the Terrace Theater has a generous ambiance. You feel special, being treated with rare accommodating care and respect. Tall windows, a copper fountain, and a fireplace in the sunken lounge just outside the restrooms are perfect for a minute of respite before your movie. Unique, aspirational, striking, functional, and stylish, it strikes us that this theater has the character and personality that is exactly the kind of development opportunity most cities would die for. With just a little time to create a proper business plan and a nationwide search for investors and sponsors, there is every reason to believe that the Terrace Theater will become not just a great community focal point and source of pride, but also an attractive, beyond-local destination and a great attractor for economic growth — more so than just another ubiquitous strip mall/grocery development could ever be on it’s own. No, restoration projects are surely not as important as caring for our middle eastern refugees, #blacklivesmatter, immigration, the many women’s equality issues, our homeless vets, childhood poverty, or LGBT rights, but when special places like the Terrace Theater are recognized and cared for, the world, and especially its’ children, is sent an implicit message that they too might have a chance of being cared for, that we’re still living in a caring world, and that we shouldn’t let go of hope just yet. With the troubles we’re seeing in today’s headlines, it seems we might be in great need of this kind of message right now. An open house with the developers is scheduled for July 13th and public meetings with city council soon after. Update—After the open house conducted on July 13th: Hy-Vee (the grocer as many had guessed), the developer, and the city appear determined to execute the plan that will demolish the historic Terrace Theater. Unless there is overwhelming public outcry, or some kind of legal injunction, demolition will begin the end of September. 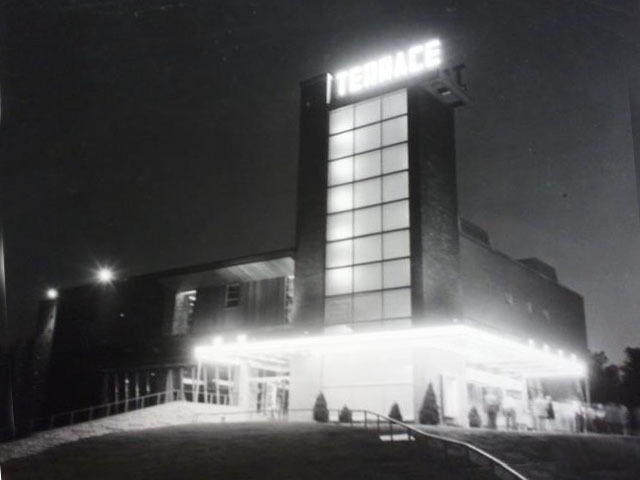 See Part 2 of the Historic Terrace Theatre story. When in Minneapolis, you can get a sense of what the experience of the Terrace is really like, but on a much smaller scale. Bill and Sydney Volks asked Jack Liebenberg and Seeman Kaplan to remodel their earlier Riverview Theater after the Terrace Theater had proven to be such a hit. A half-hour south of the Terrace, the Riverview is an active theater that still shows movies daily and is consistently rated at the top of all the “best of” lists. 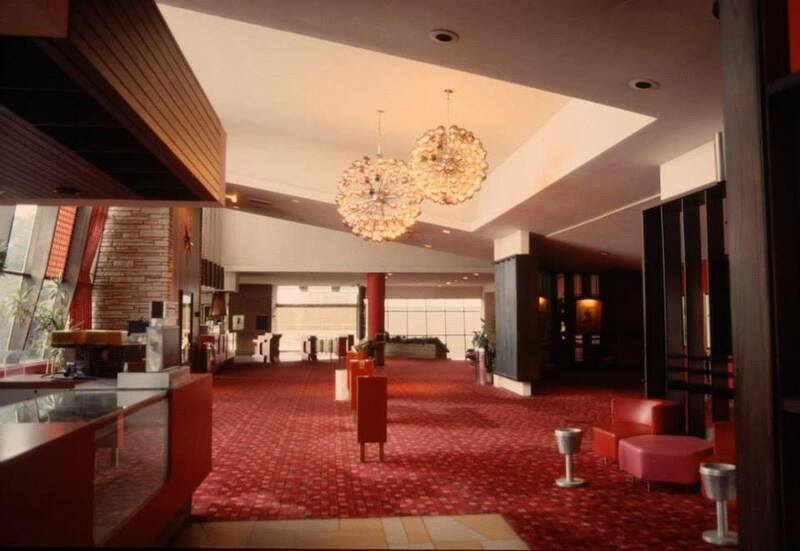 The Terrace Theatre is both historically and culturally important to the citizens of Robbinsdale, and the state of Minnesota as a whole. The Save the Historic Terrace Theatre group seek to preserve this important structure, with the intention of restoring and reopening the building to continue the service to the citizens of Robbinsdale that it began in 1951. I support the Save the Historic Terrace Theatre group in their efforts, and petition the Robbinsdale City Council to deny any and all requests for a demolition permit that is presented for this property. Thank you, Jay. I’ve filed this for future reference. I’m working some contacts at the StarTribune to be sure that the next article that comes out is much more informed than John Ewolt’s in the Business section recently. I sent a letter to the editor about that but I’m not expecting publication. There’s a lot going on in the world and I suppose saving the Terrace pales by comparison, but for whatever reason I feel very strongly about this cause. I’m looking forward to finding other ways to help.